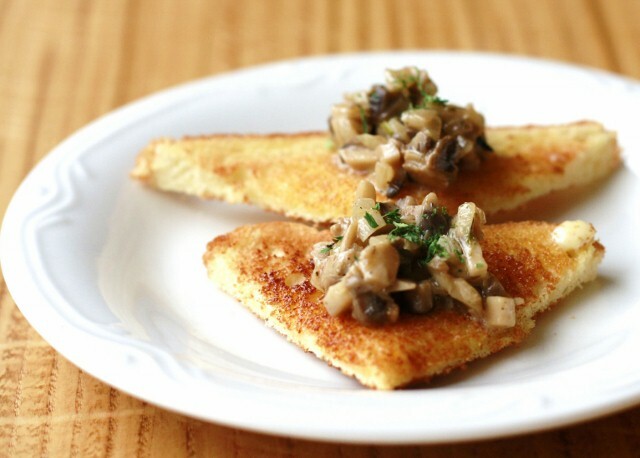 For lunch today I adapted this recipe from Smitten Kitchen giving mushrooms the ‘caviar’ treatment. True confession– I’ve never had a crumb of caviar in my life. But this recipe is exactly what I love to do in the kitchen– jazz up something simple to make it taste like much more than a few simple ingredients. I haven’t the foggiest idea if my version tastes like caviar. But I can tell you it tastes yummy, and would look elegant on toast points at a Christmas party. Actually, it looked pretty darned good at lunch today with a bunch of hungry children, most of whom went back for seconds. So good that now at 11 PM as I type out the recipe, I find myself mightily tempted to wander into the kitchen and make another batch. Mince onion. Melt 2 tablespoons of the butter in a large sauce pan over medium heat. Add onion and cook, stirring occasionally, until onion is soft and beginning to get some browned bits, 3-5 minutes.While onion cooks, wash and mince mushrooms. When onion has browned just a bit, add dried thyme, 2 more tablespoons of butter, and the minced mushrooms. Sautee over medium heat for 2-3 minutes. Add evaporated milk, and cook for a couple more minutes, until it liquid reduces a bit. Salt and pepper to taste. Toast and butter several slices of bread. (A crusty good quality bread would be best, but I used what I had: the tail ends of two different loaves of whole grain, storebought sandwich bread, and it was still wonderful.) Cut buttered toast into quarters. Spoon a tablespoon or so of mushroom mixture onto each toast point. Serve and enjoy! Ooh, I hope you like my coffeecake recipe as much as we do! Perfect! I have two cartons of Bella Baby mushrooms in my fridge and needing something to do with them. Only change I would have to make is use soy or rice milk in place of the evaporated milk so it’s vegan, but I’m sure that it will still be yummy. Thanks for sharing! I used the bread recipe from the artisan breads cookbook that you had on your wish list for Christmas. When I ordered the book on Amazon, they had a video for the basic bread. I copied it and used it all last week. It was wonderful. I even gave one loaf away. Oh yum, thank you so much for this article, i’m gonna try it out, my friend loves mushrooms!